Results from a recent online poll suggest that 71 percent of employees from the tech industry rely on the instant messaging applications at work. In international companies, it’s used by 62 percent of the workforce. These figures indicate that the sooner companies adapt to the instant messaging tools, the better and more efficient their internal communication will be. With communication being most intrinsic to human resource-related operations, the right tools can definitely help human resources (HR) drive and transform the organizational culture with the help of new age technology. An organization can successfully thrive only if its workforce is cared for and is given ample opportunities to develop. The HR department, therefore, shoulders the responsibility to establish systems for performance development, career succession planning and employee development. A well-functioning HR team aims to keep employees motivated, happy, personally engaged and contributing to company success. Though HR employees are often trained in different communication skills and methods, they frequently lack the best tool for making this communication as efficient as possible. With Office Chat, we aim to introduce a simple, secure instant messaging application that can help your HR department streamline communication processes in order to make it more efficient and productive. Here are 5 ways how Office Chat can help your HR team to be successful. New hires who are a great fit for your organization must be introduced to the company culture. The new ideas and zeal that they bring onboard must be channeled in an efficient way. This includes motivating employees to share and interact as well not making sure that they do not become bored or overwhelmed. Office Chat is available on multiple platforms. With Office Chat, the HR team can help new recruits get familiar and interact with the entire workforce using default groups. Office Chat can also help HR to encourage sharing of ideas using private and ad-hoc Group Chats. 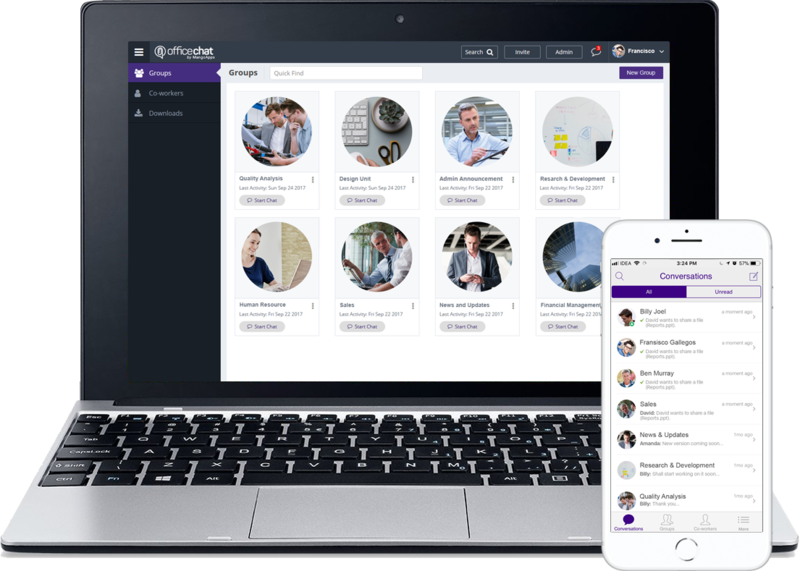 As Office Chat is available on smartphones, desktop and browser, it becomes easier for any new employee to connect with his peers without any hassle. For the HR department, collecting large documents, personal files containing sensitive data, or handling employee complaints can be difficult tasks. These tasks can take large portions of their productive hours each day. It becomes necessary to ensure that collecting this important information doesn’t become a mundane and tedious activity for the HR team. Office Chat enables file sharing up to 2GB. Office Chat ensures that both HR and employees can securely send and receive files (up to 2GB in size), simplifying the document collection and distribution part of HR’s work. All messages exchanged and files shared on Office Chat are encrypted in transit (TLS/SSL) and at rest (256-bit AES encryption). With custom data retention and deletion rules, the admins of your company can control how long your data is stored. If your employees are satisfied with their job, their workplace environment and their colleagues, they are less likely to consider other employment opportunities. One way of ensuring this is by encouraging a quality employee experience. In addition to the general well being of the employee, maintaining the psychological well-being of the workforce is of great importance. This means that HR professionals must encourage an open-door policy to discuss topics such as anxiety, working hours, unfair expectations, escalating workloads and stress levels. Office Chat private chats can be easily accessed from various platforms. Office Chat ensures that with private 1-on-1 Chats as well as with dedicated HR-related Groups, HR can help employees connect and express their concerns to the appropriate department. Also, peer-to-peer conversations or communication with senior staff via Office Chat can ensure better rapport and the well being of the employees. One of the biggest challenges that faces HR departments is communicating in a timely and efficient way with employees. This can range from announcing policy changes, new employee introductions or sending out urgent/important messages to all employees. Using emails doesn’t necessarily guarantee that these messages have been received and understood by every employee. Often critical messages get ignored while using traditional communication mediums, causing delay and chaos that has to be dealt with urgently. Office Chat Admin Announcements Group. 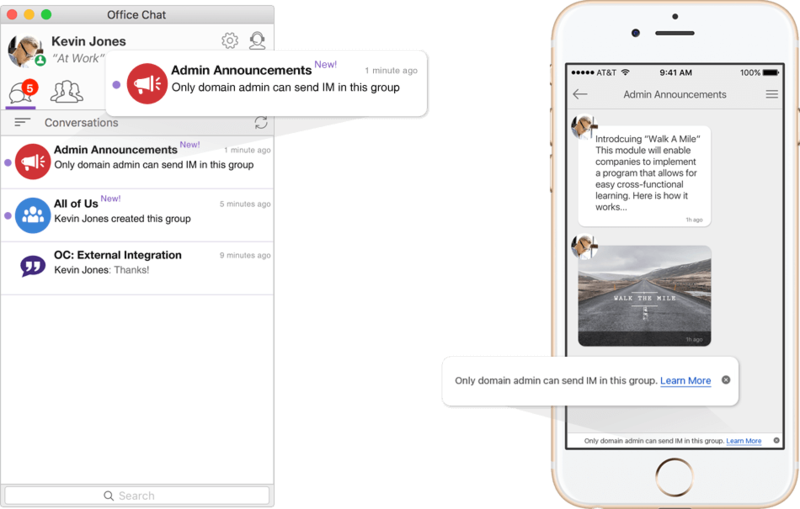 Office Chat can help streamline company-wide messages by allowing the domain administrator to broadcast messages in a group. This can be perfect for HR-related announcements. This group is designed to share important announcements and news. With a no-reply-back capability, there is no distraction and noise caused by everyone replying back in a group chat. If for some reason you don’t need this group, the domain admin can delete it at any time from the admin portal. 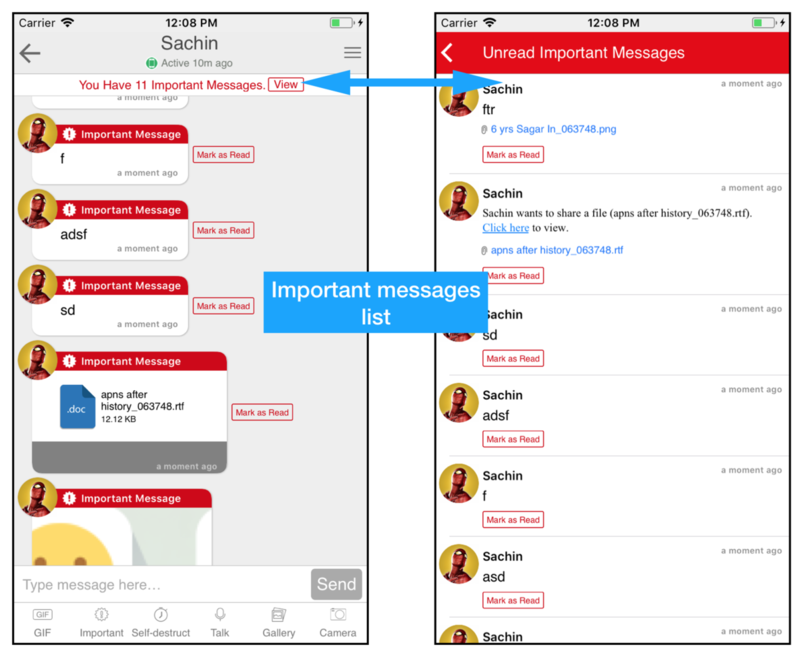 Features such as Important Messaging is a special notification for critical messages. With visual and sound notifications, these important priority messages are displayed in red above the inbox until opened. Globalization and technological advancements are constantly changing the way we do business. This means moving on from traditional head offices to remote teams, multiple offices worldwide and workforce diversity. These changes also pose new challenges for the HR team such as maintaining local HR policies as well as acknowledging location-based policies, connecting with employees from remote locations and keeping communication free-flowing and effective. Office Chat helps HR departments connect with employees seamlessly from multiple locations in real time. Employee concerns and feedback can easily be communicated. Interacting with remote teams can be done with the help of a Huddle feature using Video Conferencing. Creating groups based on location, teams, departments, designations, etc. can be easily done using Office Chat.